Since then the series has gone through a lot of changes and as with most Gameloft games are now some of the most visually impressive games available on the mobile platform. But before we head from last year’s Asphalt 8: Airborne to Asphalt 9: Whatever, Gameloft has a little spin-off called Asphalt Overdrive to keep us busy. Let’s take a look. Asphalt Overdrive is a departure from traditional Asphalt games, in which you don’t race against other drivers on a circuit. This is more long the lines of runner games, where the car drives itself and you just have to slide left or right and jump to perform stunts. Every race begins with cops chasing you. There is a button on screen that you have to press at just the right moment, which gives you a temporary boost of speed. If you miss that you have cops snapping at your heels from the beginning. Once you do that, you basically have to swipe left or right to avoid cars in your lanes or any other obstructions. You can ram into cars from the side, which gives you points. There are also ramps on the street that you can jump from and perform stunts in air. These are fairly simple, and can be executed by swiping up or sideways when you are about to jump. Actually, you kinda have to do that, because if you don’t, you lose some speed and the cops are right back on your tail again. Pulling all these stunts gets you some nitro boost that you can use to evade the cops. You can also collect the nitro while driving. It’s important to save the nitro for later because in later levels the cops just seem to come out from nowhere near the end and unless you can nitro your way out you are bound to get busted. Despite being a fairly simple game, there are a lot of excellent licensed cars to unlock and play. You can also spend in-game currency to customize and upgrade the cars, which become sort of necessary for later levels. 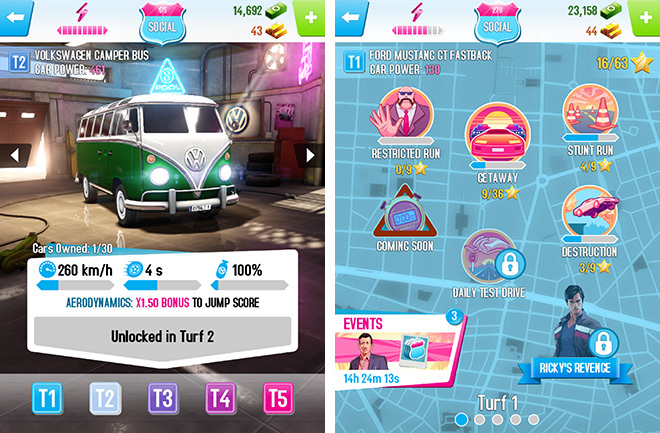 Overdrive has several ‘turfs’ for different ‘villains’, where there are a handful of race categories, such as simply escaping the cops, or performing stunts, or causing mayhem, etc. Annoyingly, you get a limited set of points you can use to play the game. Every race you start uses one point and even if you restart a race you use another point. There are very few of these and if you run out, you have to wait some time before the points get refilled or pay real money to continue. As you’d expect, there is a lot of IAP in the game, since this is a free-to-play title. 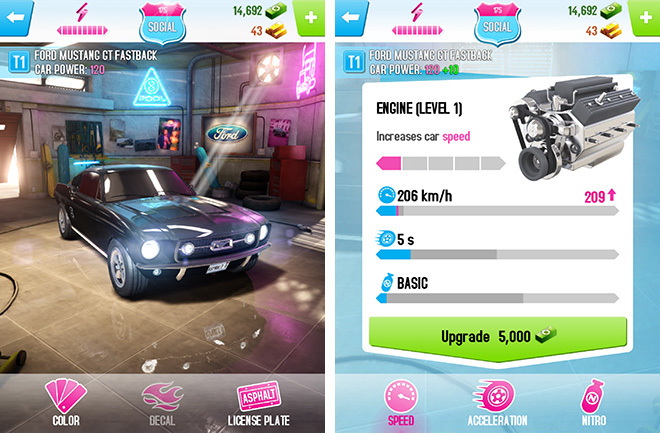 You can spend money to get in-game cash or gold, which can be used to buy more cars, upgrades, or unlock levels. The game is still playable without paying a single dime but you won’t go too far without hitting the paywall, and then your only options are to either wait and come back later or pay upfront. Oh, and Asphalt Overdrive doesn’t work offline. 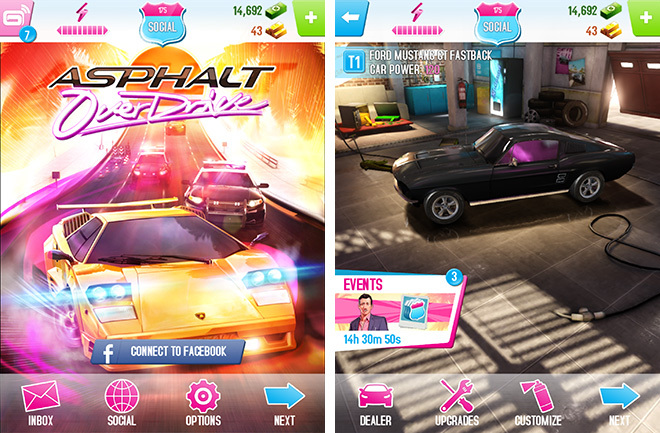 Gameloft decided on a retro theme for Asphalt Overdrive, with an 80′s California setting, retro supercars instead of the modern ones, and a cheesy menu design that is reminiscent of GTA: Vice City. While I appreciate the setting and the retro cars, the pink menus really are ugly. 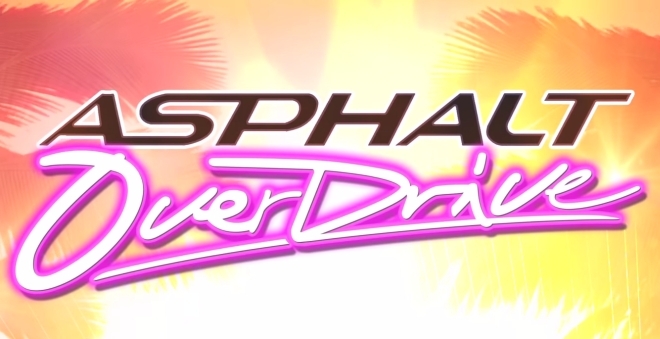 The graphics don’t seem particularly great in this version, so it’s not just the gameplay where Overdrive departs from the main Asphalt series. The game looks positively blurry on the iPad’s Retina display, as if it’s running at a lower resolution. Even on Android devices, it doesn’t look that great. The 3D models for the cars are good, though. The sound is just about okay. The music is decent and reminds me of older Asphalt games but the shouty voice clips with the tacky lines of the co-passenger or whoever, who cheers every time you pull off a stunt or asks you to go faster, are absolutely annoying. Even weirder is the game actually speaking the function of every button you press. So as you’re in the menu pressing ‘Upgrades’, ‘Customize’, ‘Next’, etc, the game is going “Upgrades, “Customize”, “Next” in an auto-tuned voice, that just sounds silly. 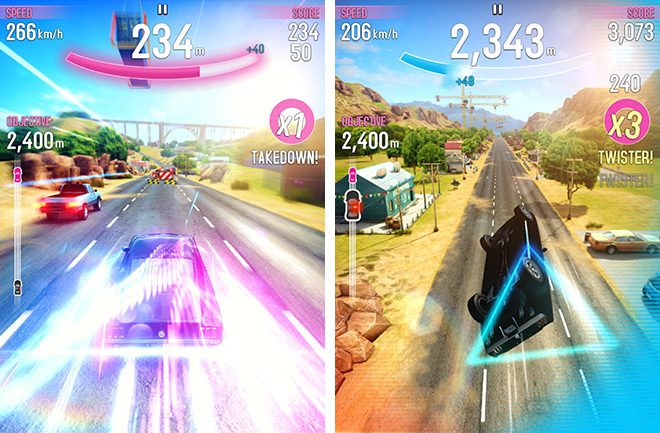 As a spin-off title, Asphalt Overdrive isn’t really asking itself to be taken too seriously as the other games in the series, which themselves are arcadey mobile games. The gameplay is temporarily interesting but gets boring quickly. Even if you try to play it for a while, the game will stop you and ask you to come back later when you run out of points, unless you choose to pay, of course. The visuals aren’t great and the sound is annoying at times. There is not much to like here but it’s a free game so install it, play it for a few minutes, and when you run out of points, uninstall it like I did.